I’ve just come back from visiting my mother a 90 year old tennis fanantic. I picked up last week’s New York Times Magazine and there, on the cover, is Rafael Nadal, the curremt number one in men’s tennis and as well as the current heartthrob for women. I look at Nadal and Federer as Borg and McEnroe: Borg was the pin-up but they could both play tennis. They were like oil and water during their heyday three decades ago, but John McEnroe, the brassy New Yorker, and Bjorn Borg, the cool Swede, are the best of friends now. Such good friends that Borg agreed to fly to New York to play McEnroe on Thursday in a charity match on Randalls Island. 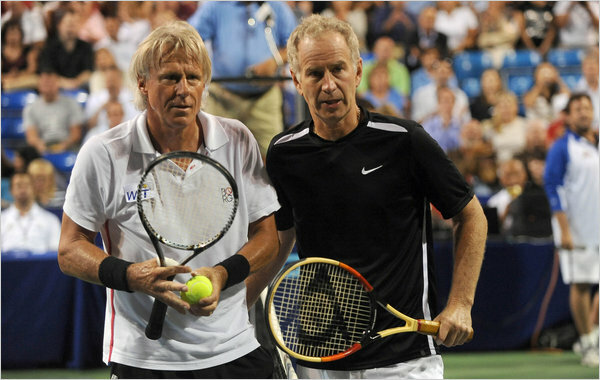 True to form, McEnroe won many of his points at the net, while Borg favored backhand slices and a strong serve. McEnroe, who had played a doubles match before taking on Borg, was in character, slamming his racket against a baseboard and holding his hands on his hips after losing several points. But when their match ended in front a crowd that included the former Mayor David N. Dinkins, they hugged at center court. The result, they said, was less important than their friendship and their efforts to promote tennis. Borg and McEnroe, of course, are best known for their epic 18-16 tie-breaker in the fourth set of the final match at Wimbledon in 1980, which Borg eventually won. McEnroe won the next year, ending Borg’s five-year championship run at the event. By 1983, Borg retired; McEnroe followed him a few years later. But for those few years, they played great tennis and provided a contrast in styles that came to characterize their generation. Borg, the quiet gentleman, was a link to the game’s more patrician roots, which were fading. McEnroe, an argumentative finger-pointer, typified a new era when athletes were more openly blunt and out for money. According to the ATP, Borg and McEnroe played 14 times and 7-7. Rafael Nadal will have to beat Swiss players back to back to win his second Australian Open on Sunday, and may have a slightly tougher time of it against Stanislas Wawrinka than he did in a curiously uneven semi-final against Roger Federer on Friday. The world No1 took two hours and 23 minutes to win 7-6, 6-3, 6-3 – his 23rd victory over the Swiss, in 33 matches, moving him to within a win of drawing alongside Pete Sampras on 14 slam titles – and three behind Federer. Sampras was in the audience at the Rod Laver Arena, the first time he saw them play each other live. Rafael Nadal, left, shaking Roger Federer’s hand after their match. 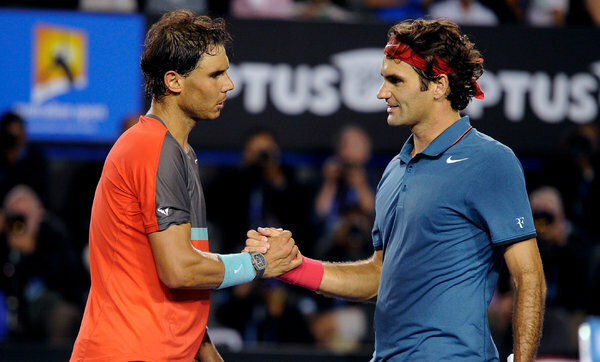 The Nadal-Federer rivalry ranks among the most compelling and the most lopsided in tennis history. It was more difficult for Federer to explain why he struggled so with Nadal. He tried. To play Nadal, he said, was different from playing Djokovic or Murray. To beat Nadal, Federer could not play the way he wanted. He needed to be more aggressive, to hit at sharper angles, to take more risks. His explanation was more fact than excuse. Nadal makes Federer play like someone else. “I enjoy playing against him,” Federer said, a comment that all but begged for a lie-detector test. Pete Sampras watched them live for the first time. …Earlier in the day, Sampras gave a long, thoughtful, conflicted answer about the greatest-of-all-time debate. Some decades, he said, seemed to have one player who stood above the rest. There was Rod Laver. There was Sampras, although of himself he said only, “I certainly had my moments.” Now, there is Federer and Nadal, greatness squared, and while Federer is 32 and Nadal is 27, their respective careers have overlapped for years — and much of their primes have, too. That it is, an era-defining rivalry, must-watch TV, every time the two of them take to the court. Even if one of them, the left-handed baseline bully, the Spaniard who answers to Rafa, now seems to win most every match that matters. And my mother would have enjoyed every minute of yesterday’s match.